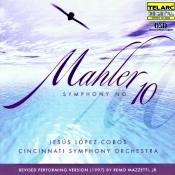 Jesus Lopez-Cobos, Cincinnati Symphony Orchestra. Telarc CD-80565. Austrian composer and conductor Gustav Mahler (1860-1911) has been popular among audiophiles since the early days of stereo, and it was Mahler who first filled up the bins in the early days of compact discs. It's no wonder, then, that even his unfinished Tenth Symphony remains competitive today, with two releases of different reconstructions coming out at around the same time from Simon Rattle (EMI) and Jesus Lopez-Cobos in the early 2000's. At his death Mahler left the Tenth Symphony in various stages of completion. A couple of the work's five movements were finished, and several others the composer left in detailed sketches only. For years, conductors only performed the two completed movements, and some purist conductors today apparently still insist on doing so, but the music as reconstructed by various people in various forms seems to be gaining a new audience. 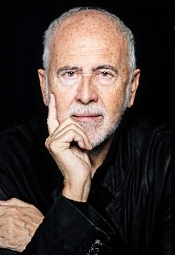 Maestro Jesus Lopez-Cobos uses one of the most-recent revisions, that of Remo Mazetti, Jr. (1997). Lopez-Cobos presents the piece in a fairly gusty and Romantic manner, mostly emphasizing the work's soaring lyricism, as in the first movement, and its bizarre eccentricities, as in the two Scherzos and the introduction to the Finale. Telarc's sound upholds its end, too, with its warm, natural presence. All fine and good had I left well enough alone. But I couldn't resist listening the symphony again, this time comparing it side-by-side with Simon Rattle's account with the Berlin Philharmonic. Comparisons can be devastating. Perhaps it wasn't an entirely fair comparison, either, because Rattle uses the older Deryck Cooke edition and, as I said, Lopez-Cobos uses the newer Mazetti one; still, it was close enough. My conclusion? Next to Rattle, Lopez-Cobos seemed rather earthbound. His interpretation, so lovely on its own, appears straightforward and mundane by comparison to Rattle's. It's like plain vanilla vs. Swiss chocolate swirl. Rattle wrings every ounce of emotion from the score, making one pine and long for the participants, presumably Mahler and his lost love, Alma, whom Mahler had discovered having an affair in his last year. The sound, too, favors Rattle. While Telarc's sonics are certainly worthwhile, they tend to sound muted, soft, and flat compared to EMI's live recording (which in itself is remarkable, considering that I don't usually care for live recordings). Rattle's orchestra does appear a bit harder and thinner than Lopez-Cobos's, to be sure, but the great Berlin strings more than make up for it. In the end, EMI's sound comes off as more transparent, more dynamic, and, ultimately, more realistic than Telarc's. Both are good investments, but if one must make a choice, I would recommend one opts for the Rattle.